Is Bhakti Dormant in Us? Question: Since we are part of Krishna, and since Rādhārāṇī is also part of Krishna, does that mean we have part of Rādhārāṇī in us? Bhāgavatam explains that we are different parts. Rādhārāṇī is the what Bhāgavatam describes as bhakti-śakti, and we are what Bhāgavatam describes as taṭastha-śakti. There is an intrinsic relationship between bhakti-śakti and taṭastha-śakti, however: the taṭastha-śakti can become an instrument of bhakti-śakti. So, we can become an instrument of Śrīmatī Rādhārāṇī. Question: Why do some people say we have Bhakti in us, but it is dormant and we have to reawaken it? Different people have different ways of expressing things. We are meant to be an instrument of bhakti-śakti – so one could describe that as having the dormant capacity for bhakti, and this capacity has to be awakened or realized. Bhakti, however, is actually something much greater than us. We do not possess it. We are just hoping that it will possess us. We do not create it, we are just hoping that it will use us in its play. Question: If Krishna is omniscient, wouldn’t he know what Rādhārāṇī’s love feels like? 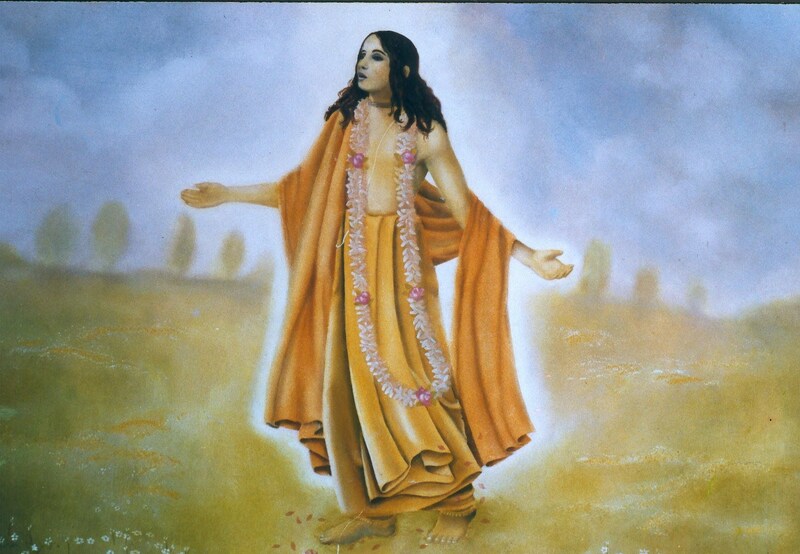 Why would he have to become Śrī Caitanya Mahaprabhu to experience it? His omniscience will not interfere with his primary reason for existing – bliss. Just as we also can forget or ignore things that interfere with our enjoyment, he also certainly can. His omniscience is only a servant of his bliss. In the bliss of love, he experiences that Rādhārāṇī is someone whom he cannot fully fathom, and he joins with her as Śrī Caitanya Mahaprabhu to try and experience firsthand what she experiences. Next Am I an Avatāra? Nice post Prabhu & a very important topic. I believe that what we believe about this issue has an impact on the kind of sadhana that we perform. If we believe that Bhakti/prema is intrinsic in the Jiva, then we also have to infer that the Swarupa of the Jiva is fixed for all eternity & thus no sadhanas need be done to specifically manifest it. This in turn has further effects down the road. For example, we may assume that every single soul in the world is a devotee waiting to pop open & thus feel impelled to “preach” feverishly to one and all & annoy everyone around us consequently. I wonder if I’m reading too much into this? I knew she meant I was born with this insatiable desire and devotion, this longing for spiritual Truth that I first realized at the age of three. “I AM Bhakti” … this is an intrinsic part of me (from lifetimes of sadhana) that, like the color of my eyes, cannot be changed. It simply is. Yet it’s a means to an end, not the end itself. The end, of course, being the road to Self-Realization the boon of Bhakti lead, along with the three other major tenants of yoga, lead me to. So the question of whether we’re born with Bhakti or if it finds us…I have never not known Bhakti (of course I didn’t know the Hindu term until 28 years ago, in my early 20s), but this devotion and desire for Union. It’s always been at the fore of my life. A most important part of who I am. An intrinsic part. The word Bhakti is thrown around in the modern western world in simplistic terms (the past 10 years). I appreciate your blog post. I agree with most of your deductions based on the texts. Although for me the experiences always came first and the texts are used to understand my experiences. In other words, the Truth is found within the spaces been the words of the texts: within the Self. Always and only from within. The study of texts is crucial to understanding our journey, and the sākti contained in the revealed texts puts one in a state of Union. Yet book knowledge, no matter how profoundly understood, is the use of the analytical mind. The state of Union is beyond words. I’m not criticizing your findings, I’m simply not understanding to what end your argument means to gain. I do love your mentioning of bhakti-sākti. My students often call my energy bhakti-sākti, which of course is a reflection of their own energy. Such great Hearts! I honor your journey and appreciate both your Easy Sanskrit blog and the sharing of your experiences and knowledge. A wonderful expression of The Self. Shastra is not “book knowledge”. And our experiences are like preschoolers talking about their experience of calculus. I know the meaning of shastra. By “experience” I meant direct experience of The Self, nothing less. Sorry. Didn’t mean to be defensive. Just stating my opinion clearly. Of course we can have different opinions. That’s for sure. But my experience of devotion and longing goes back to my earliest memories. I had the worst week last week. I shouldn’t have been online… obviously, I didn’t read your title correctly. And again, I am learning much via your Sanskrit blog. I look forward to a future of wonderful sharings. Vraja- Please forgive my mistake. This has been a hellish two weeks in the physical body (disabled due to incurable spinal diseases). Communication breakdowns have been happening all week. In short, Maya is kicking my buttocks left and right. I love your blogs. I was looking forward to years of dialogue. Don’t worry about it! Bhakti is not dormant in the jīva. That’s just gaudiya philosophy established by Śrī jīva goswami on the basis of Bhāgavatam. We can certainly have different opinions.